Doctors agree early detection increases a woman’s chance of surviving breast cancer. If found early, and before it reaches the lymph nodes, the five-year breast cancer survival rate is 100 percent for patients with stage 0 or stage 1 cancer and 93% for those with stage 2 cancer, according to the National Cancer Institute’s SEER database. Until now, digital mammography—a 2-dimensional picture of the breast, has been the standard screening tool to detect cancer. 3D mammography offers a more accurate look at the breast. It allows the radiologist to examine your breast tissue one layer at a time. 3D mammo converts digital breast images into a stack of very thin layers or “slices” to build what is essentially a 3-dimensional mammogram. A good analogy for 3D mammography is like pages in a book. Look at the cover and you cannot see all of the pages. Open it up and you can go through the entire book page-by-page to see everything between the covers. 3D mammography shows the radiologist all of the pages in the book. Increase early detection of invasive cancers compared to 2D digital mammography alone. Who Should have a 3D Mammo? 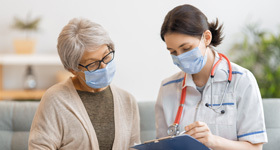 Guidelines are the same as for mammography in general: yearly mammograms starting at age 40 and if over the age of 75 the benefits should be discussed with your physician. If you are under 40 year of age, you will need an order from your physician for a screening or diagnostic mammogram. The technologist reviews the images right at the workstation to ensure the images are adequate for the radiologist to review. Your results will be interpreted by a radiologist. We use Computer Aided Detection (CAD) which is like a second set of eyes that looks at your mammogram. The report is sent to your primary care physician or OB/GYN who can discuss the results with you. If there is an abnormality, we will talk with you and your family and go over your next step. Northwest Healthcare offers online appointment scheduling for mammograms.